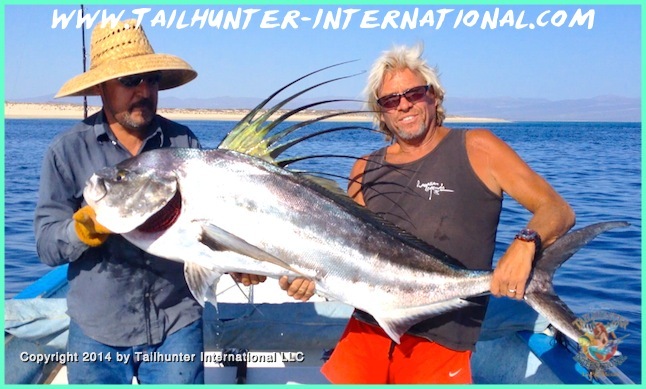 This is the “beast of the week.” With a rooster estimated by Captain Jorge and others as in the “80-85 pound class,” our amigo, Rick Kasper, who has caught lots of big fish with us, shows off his biggest and best with this huge rooster that he caught and released just off the beach at Las Arenas. Nice way to celebrate a honeymoon! All the way from Argentina, Mauricio Ohashi, nailed this gigantic roosterfish on a live ladyfish near Punta Arenas with an assist from Captain Gerardo who helps hoist the big fish. 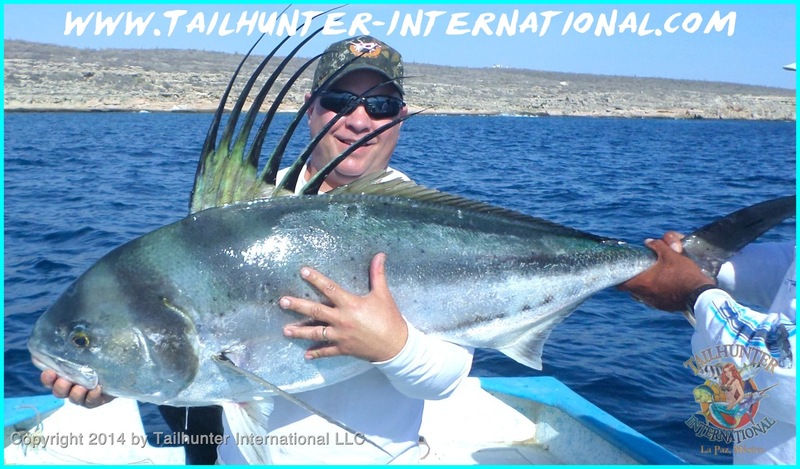 Mauricio caught and released two of these giants on this particular day. First timer with us, Felix Williams from Ladera Heights, CA near Los Angeles fished a few days with us and got into a nice jag of dorado one day when the dorado went off outside of Bahia de Los Muertos. Don Swenson from Washington State really wanted a roostefish and had one day to take a shot at it. He set him up to go out on one of our Tailhunter pangas and they hooked up 6 roosters and got 3 roosters to the panga that were all released. Here’s one of the nice ones! Scott Behnken is all smiles with Captain Jorge hidden behind the comb of Scott’s biggest roosterfish caught off the beach at Las Arenas. He was using live bait to get the fish. That’s Cerralvo Island in the background. Ron Lawver from Phoenix AZ hung in there during a tough week of fishing and never ever stopped laughing and smiling. 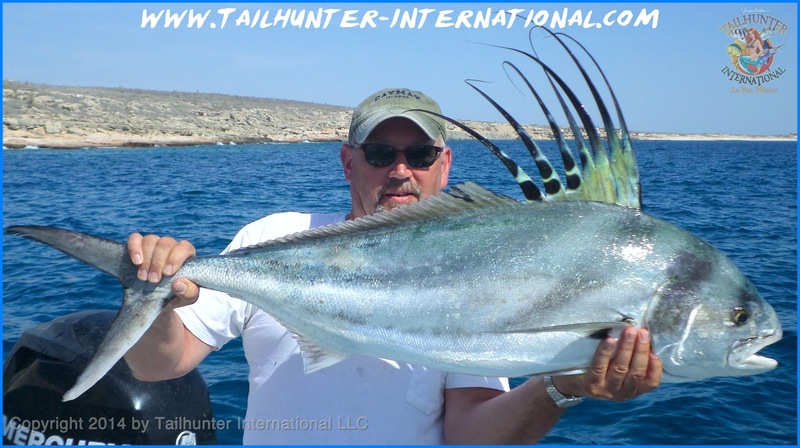 He caught and released this rooster just outside of Bahia de Los Muertos. He finally got one! 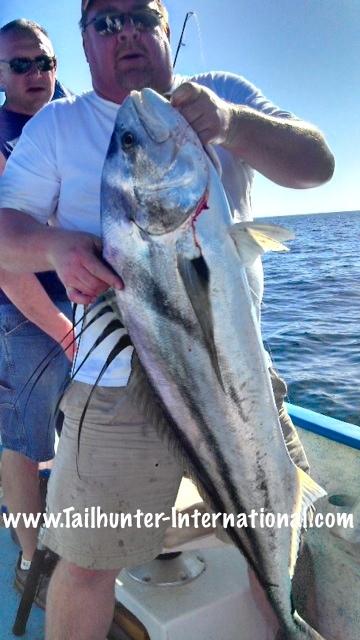 From Washington, Todd Olson hefts a big fat roosterfish that’s as thick as it is long! It’s the fish he came to get and it turned out to be a trophy! Yes…there’s other fish around! 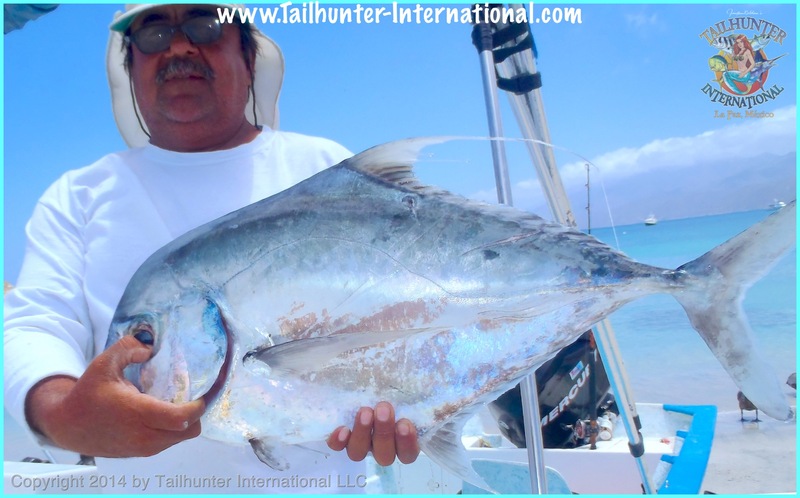 Captain Victor poses with a huge pompano, related to roosterfish, jack crevalle, yellowtail and amberjack caught by clients just off the beach at Bahia de los Muertos. I can’t say fishing is great or even good, but by the same token, I wouldn’t say it’s bad either. It’s just “different.” Quite a few happy anglers but the catch just isn’t what we usually see right now. I will say one thing, that even with the gigantic full moon this week, it was better than I expected. 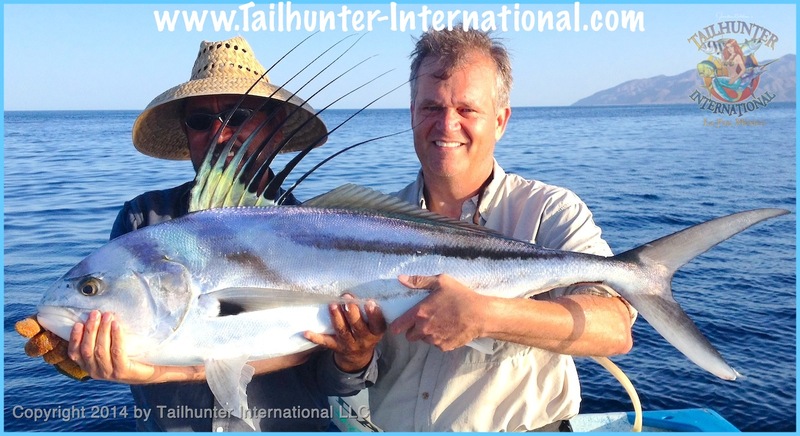 The rooster fish bit solidly all week and they were some spectacular fish. 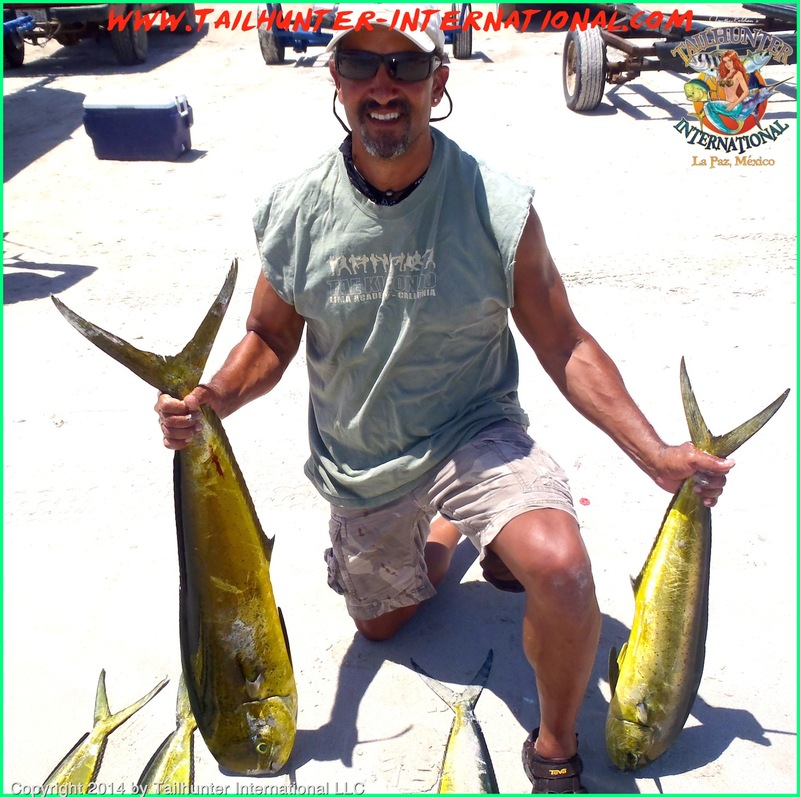 Every day we got 30-60 pounders and many were lost and happily all of the fish were released swimming away strongly! For many of our folks, it was their first rooster or, their biggest rooster, or in some situations, they weren’t even expecting anything big and, as luck would have it, they tied into some trophy roosters! 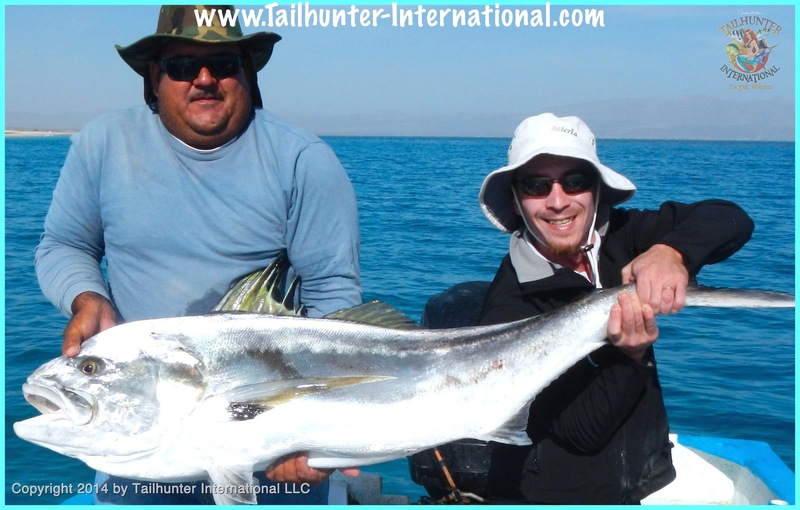 As well, we had some better action on dorado with some of the larger fish we’ve seen this early in the season and some legit 25-35 pound bulls taken at both our La Paz and Las Arenas fleet. I will say this. Toward the end of the week water temperatures jumped. The plankton that has been coloring the waters green burned off. Waters turned blue and cleared up in so many places. And with it…the dorado bite surely seemed to get stronger. We’ll keep an eye on it and hopefully this is a sign of continuing better fishing! On other fronts… wahoo season has been rocking along nicely. Normally, we don’t see many wahoo until about this time of the year, but we’ve had a steady wahoo bite around Cerralvo Island now for 2 or 3 months! There’s some quality 20-50 pound fish out there and other “grandes” that never made it to the boat. Air temps are in the low 90’s with some Santa Ana style warm breezes blowing. Several days the winds were pretty strong affecting fishing. Water is a bit off color either because of the winds or because of plankton in the water but as mentioned above, clarity and visibilty have improved rapidly . A few more degrees warmer and it’ll all burn off.